What’s First Friday’s you say? During the months of March to December, Historic Downtown Florence comes alive with art, music, shopping and entertainment. It’s truly a family event that should not be missed. On The Rocks throws our creative hat in the ring with our famous Shrimp & Crawfish Boil. 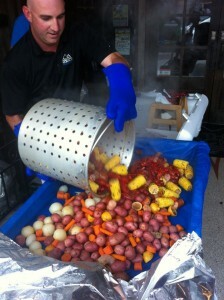 We offer hot and tasty plates of food fresh out of New Orleans’ styled gas burning pots. Come down early and stay late – you’ll have a blast! !